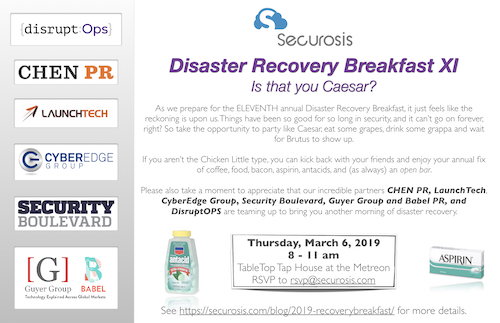 Home » Security Bloggers Network » The ELEVENTH Annual Disaster Recovery Breakfast: Is that you Caesar? As always the breakfast will be Thursday morning of RSA Week (March 6) from 8-11 at Tabletop Tap House in the Metreon (fka Jillian’s). It’s an open door – come and leave as you want. We will have food, beverages, and assorted non-prescription recovery items to ease your day. Yes, the bar will be open. Mike has officially become an old guy and can only drink decaf coffee (high blood pressure, sigh), but you can be sure there will be a little something-something in his Joe.